Jera Davis is a Ph.D. candidate at the University of Alabama and the director of the Moundville Plaza Project. The summer work has officially begun, and I’m happy to say that it’s off a smooth start. The range of first day activities included such time consuming tasks as moving all our gear from UA campus to Moundville, locating and stringing our units, and erecting canopies, but we had all of this done by 2:00 in the afternoon. Crew members at present include myself, Erik Porth, Daniel Salberg, Clay Nelson, Daniel Cardwell, Kimberly Peace, Aaron Posey, and Traci Roller. Several others will join us in the coming weeks. The crew is divided into three teams and we are quite spread out. Artifacts and features have been very few so far, but that is to be expected since we have are not yet digging in undisturbed prehistoric deposits. The view of Team 1 (at left) from Team 3 (bottom right/center). Team 1 (Erik and Daniel C.) is located just off the back patio of the museum at a spot in the plaza where the magnetometer shows multiple large structures arranged in a courtyard group. Erik and Daniel C. have the pleasure of working under our largest canopy, graciously loaned to us by Moundville’s Office of Archaeological Research. Team 1 is closer to the road than the other two teams, and so has already entertained several visitors. Could you be next? We hope so! The magnetometer anomalies being investigated by Team 1. 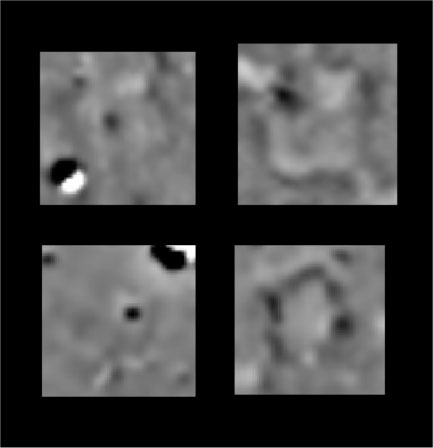 The anomalies appear to represent several rectangular structures arranged around a courtyard. The courtyard is open to the east and the structures are oriented to the cardinal directions. The largest structure may be over 72 square meters (777 square feet) size. These are likely to have been public buildings. Team 1 has already punched through the plowzone and have recovered a few lovely sherds (pieces of pottery) from the 14th and 15th century. The plowzone layer is nearly ubiquitous at Moundville, since the site was divided among different farmers before the 1930s. Artifacts recovered from the plowzone have been displaced from their original locations by historic period plowing, whereas those recovered from lower layers are relatively undisturbed since Pre-Columbian times. Erik Porth mapping the soils that can be seen at the base of the plowzone. Team 2 (Dan S., Aaron, and Traci) is excavating in the south-central plaza at the location of an apparent domestic house group composed of multiple structures also arranged around courtyards. Dan S., Aaron, and Traci are through the plowzone and going strong. The magnetic anomalies being investigated by Team 2. These are similar to those being excavated by Team 1, except smaller and more numerous. There may be two “courtyard groups” here, with individual structures oriented to the cardinal directions and courtyards open to the north. These were probably typical houses of extended families. Team 3 (Jeremy, Kimberly, and Clay) is excavating about 150 feet south of Mound A, which lies at the direct center of the plaza. Jeremy, Kimberly, and Clay have been investigating a broad arc of what appear to be large posts. An arc of anomalies near the center of the southern half of the plaza appears to represent several large posts. Finally, we’ve made some new friends that live in a tree behind the shed at the Office of Archaeological Research. Traci named them Skippy, Dippy, and Zippy and I believe they’ve agreed to be project mascots – one for each team! For the record, Team 3 claims Zippy for its own. 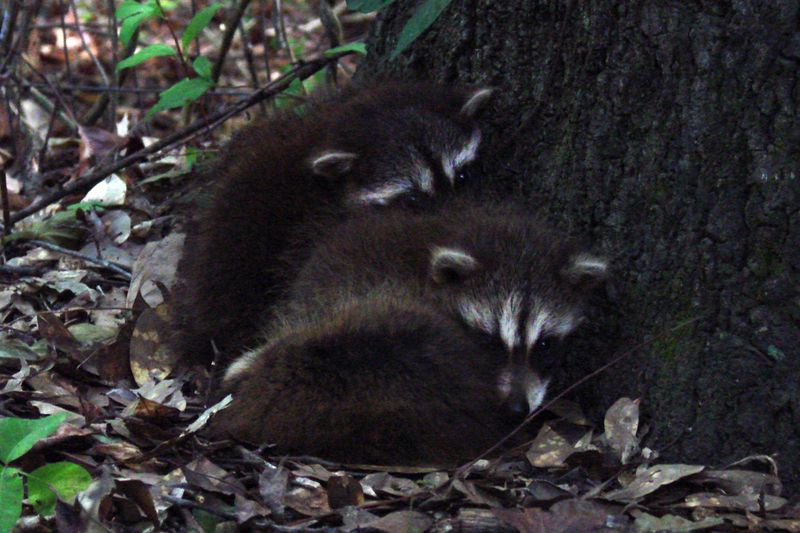 Skippy, Dippy, and Zippy, the baby raccoons claimed as project mascots. Our raccoon mascots as the Mississippians would have seen them. An engraving from a conch shell cup (Phillips and Brown 1978, Plate 237). In the spring and fall of 2010, Dr. Chester Walker of Archaeo-Geophysical Associates, LLC, accomplished the largest-scale magnetometer of a Mississippian site to date. He covered almost 60% of the Moundville site, including the entire plaza and almost all of the mound summits, in only ten days by towing the magnetometer array by ATV. 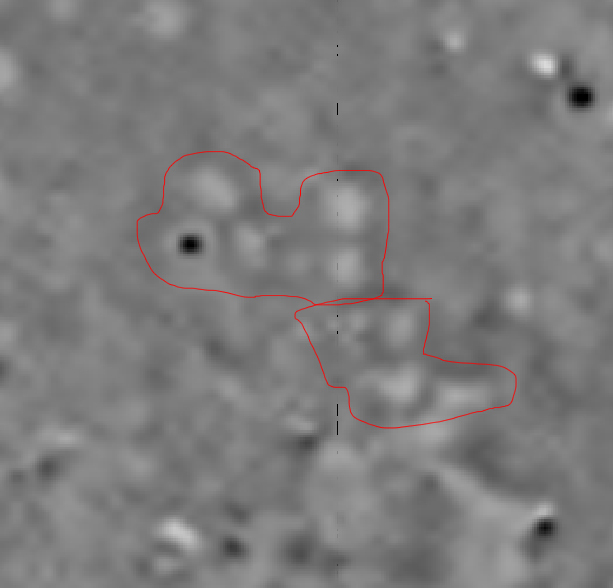 Hundreds of magnetic anomalies representing ancient hearths, house walls, and other archaeological features manifested in shades of gray throughout the survey area, including the under-investigated and poorly understood plaza. Some anomalies appear to represent circular and rectangular buildings far larger than anything previously known at Moundville. Excerpt from the Dr. Walker and Dr. Blitz’s poster presented at the Southeastern Archaeological Conference in Jacksonville, Florida. 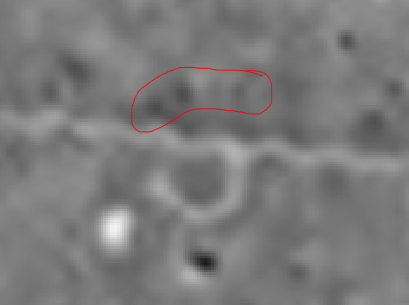 Examples of ancient house anomalies – rectangular outlines (walls) often with dark dots (hearths) near their centers. Hundreds of house anomalies are visible in the magnetometer map of the plaza area. We cannot know for sure what the magnetometer detected until a sample of the anomalies has been excavated. 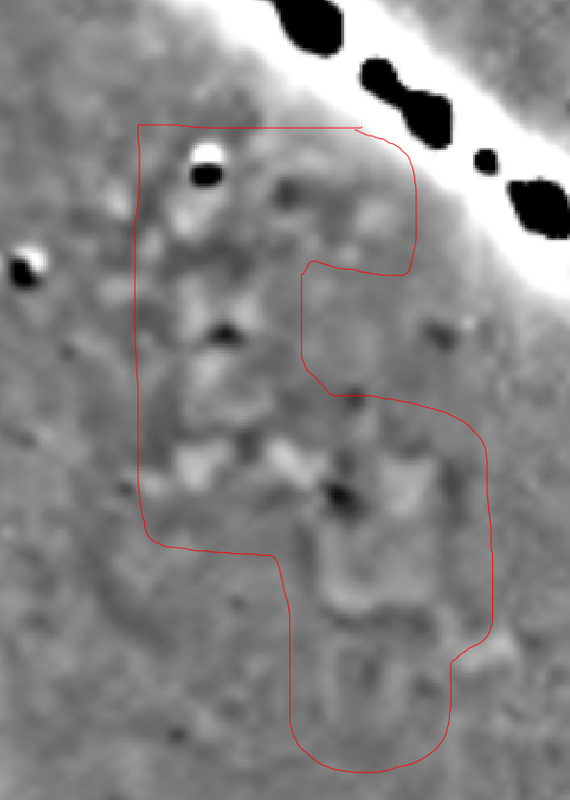 This is called “ground-truthing.” For example, if we suspect that fuzzy, dark gray dots in the magnetometer survey map represent the locations ancient hearths, we must excavate at the locations of several “dots” to confirm. Since May 2011, I have been supervising University of Alabama field school students and volunteers in the ground-truthing of suspected hearth and building wall anomalies. I am pleased to report that with the help of the magnetometer map, we have been able to pinpoint specific kinds of ancient remains with an accuracy that is unprecedented in the history of archaeological investigations at Moundville. 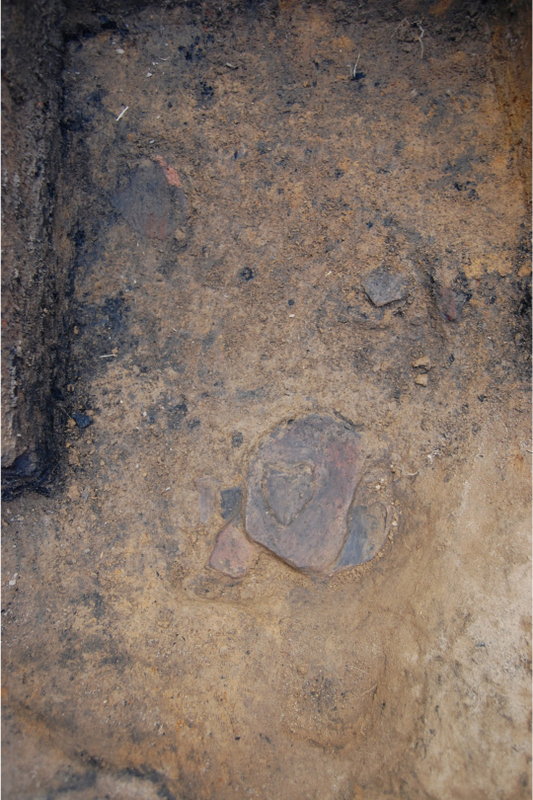 A fired-clay hearth located with a 1-x-1 meter excavation unit. In the process, we have learned a bit about the pre-plaza surface. The evidence suggests that it was a ridge-and-swale landscape that was frequently if not always flooded in places. We can tell this by comparing the soils layers encountered in each of the excavation units. Some of our units struck culturally sterile subsoil, a reddish clay, immediately under the 10-20 centimeter thick plowzone layer. This soil is typically encountered at deeper depths and below other natural soil horizons. Subsoil at such a shallow depth and without any overlying natural soil layers is evidence that the Early Moundville people stripped off the high points of the natural landscape in their construction of the plaza. Excavation units elsewhere in the plaza encountered up to a meter of redeposited soil overlying natural strata. At one location, we found this fill layer overlying clays that only form in anaerobic, swampy conditions. 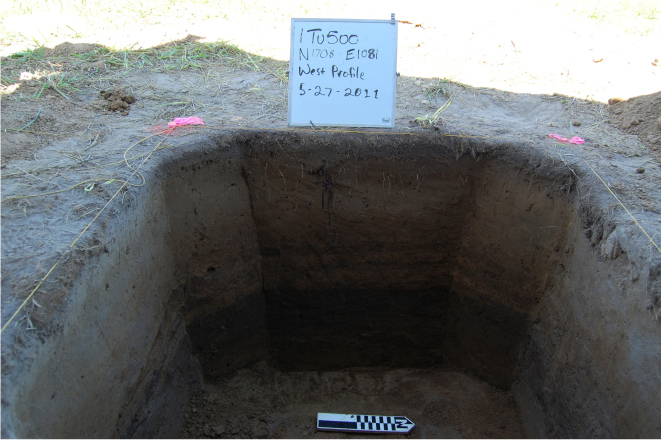 A unit profile showing subsoil beneath the plowzone, evidence that the ancient Moundville plaza-builders scoured the upper layers of soil from the natural high spots of the pre-plaza landscape. A unit profile showing plaza fill overlying natural stratigraphy and swampy clays (the lighter soil at the base of the profile). 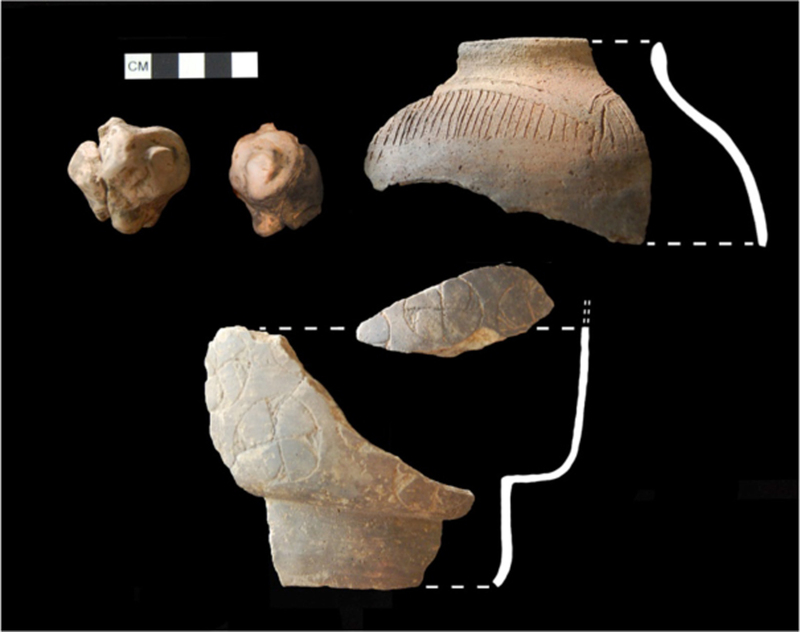 Building remains, sherds (pieces of pottery), and other ceramic objects hint at local cultural continuity in addition to connections with populations to the north and east. 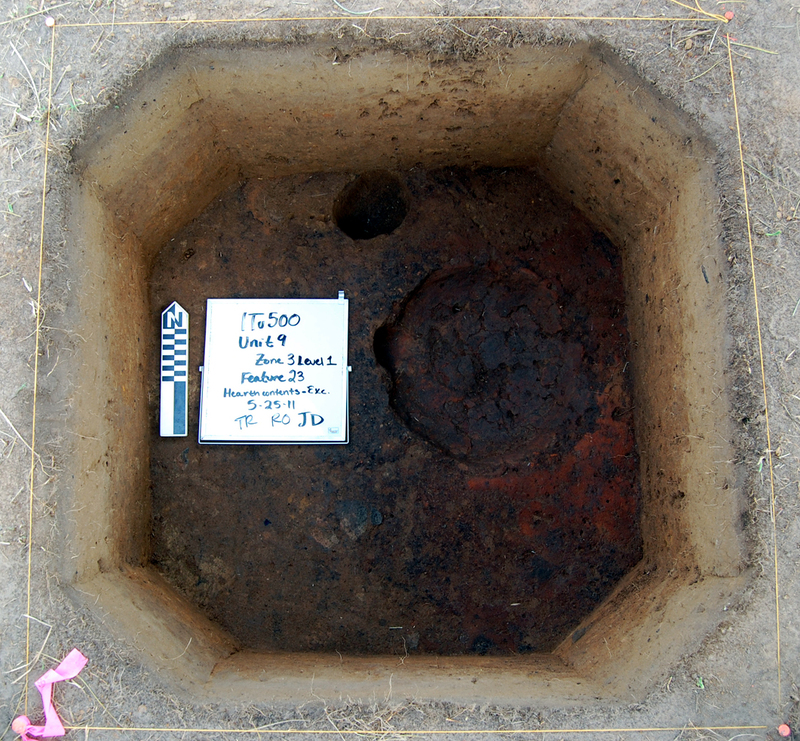 We documented three different architectural forms on the pre-plaza surface: single-set post wall, wall-trench, and pit house. Single-set post construction was practiced in the Black Warrior Valley for centuries before the founding of Moundville. 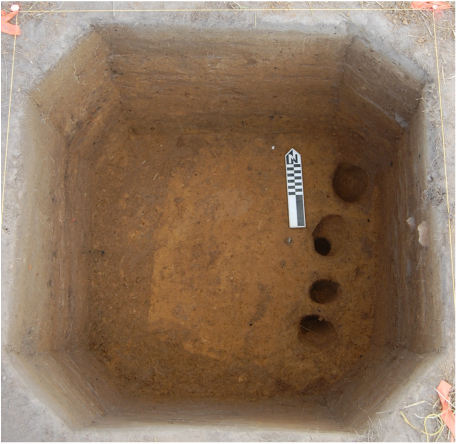 Wall-trench and pit house styles are introductions from elsewhere in the Southeast. 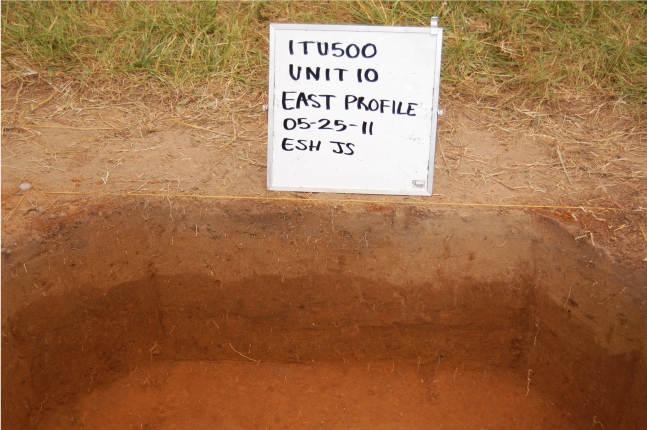 The contemporaneity of these forms during the Early Moundville period suggests a culturally diverse community practicing local and nonlocal traditions. A portion of a single-set post wall buried by a meter of plaza fill. The corner of a pit house. Most of the thick charcoal layer has been excavated. The locations of postholes intruding the charcoal layer can be easily seen. Most of the sherds appear to come from locally made pots in recognizable Moundville shapes and styles. As with the architectural forms, some ceramics evidence interaction with more distant populations. Some ceramic artifacts recovered so far. In the upper left, a painted owl effigy (just the head). In the upper left, an incised jar fragment. Bottom center, sherds from an elaborate, terraced vessel engraved with swirl crosses. Red paint was rubbed into the swirl cross engravings. Not all of the preplaza contexts we encountered can be considered strictly domestic. For instance, some evidence for ritual activity and perhaps ritual crafting comes from a complex midden (trash heap) filling an earlier pit-house. The upper portion of this midden yielded an interesting array of apparent special purpose objects including a fragment of a hooded bottle, fragments of a burnished bowl that clearly contained red pigment and sheet mica, and multiple effigy pieces including two ceramic owl effigies. One of the owl effigies came from a small pocket in the soil that included several bird bones and a knapped quartz pebble. Aside from the artifacts, the midden included multiple fist-sized lumps of white, red, and purple clays. Painted pottery and some fine pottery coils suggest that at least some of the residues in this unit evidence pottery production nearby, and the thick charcoal layer may have resulted from firing pots. Beneath this layer, artifacts declined sharply in abundance, except for a scatter of large sherds lying flat against the house floor, some of which were stacked like decks of cards. Sherds stacked on the pit house floor. 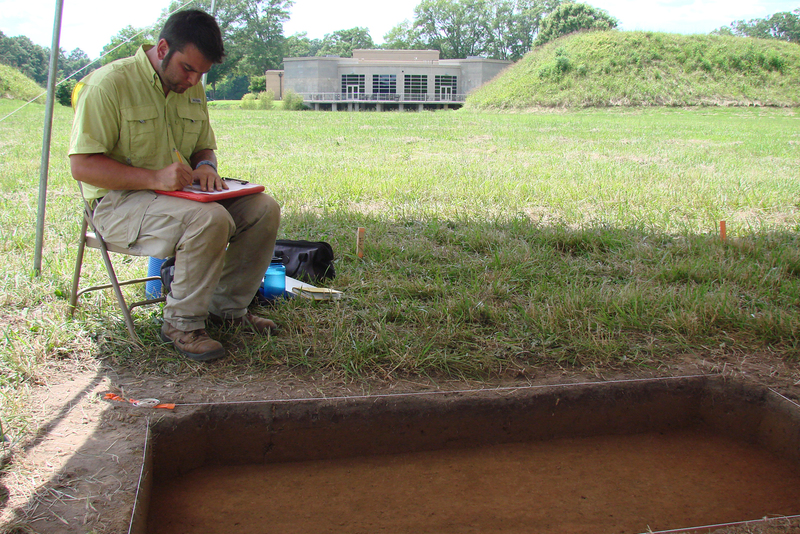 In sum, the magnetometer survey offers an unprecedented opportunity in Moundville archaeology to understand the plaza in both broad and fine strokes. The first phase of ground-truthing is not yet complete, and yet has already provided a stronger basis for classifying many untested anomalies. The great majority of artifacts and features derive from pre-plaza contexts. They evidence early and intensive use of the plaza area as both a ritual and domestic space in which old and new traditions were enacted, negotiated, and redefined. The plaza buried this fractional and contested landscape. The magnetometer map offers many more opportunities and we will soon take advantage of some of them. Fieldwork begins again next Monday, May 21st. By A.D. 1120, approximately eighty years prior to the first traces of a recognizable Moundville chiefdom, the culturally diverse community settled on the high terrace at Hemphill Bend on the Black Warrior River was in the early stages of a sociopolitical transition. Little of what would later typify Moundville material culture had been decided upon at this early date. Households expanded and fissioned in nonpatterned ways, with families seemingly striking out at random rather than maintaining claims to specific spots on the landscape as they would in the centuries to come. Some built houses that combined traditional single-set post styles with the newly introduced wall-trench forms while others kept them distinct. Likewise, they adhered to local potting techniques, wholly subscribed to foreign ones, or blended these in novel ways. These people built the first two mounds in the valley: Mound X at the Moundville site and Asphalt Plant mound on the same terrace about 800 meters to the northeast. The mounds were pivot points in the reconciliation of a traditional egalitarianism with an emerging institutionalized hierarchy. The massive building project that accompanied Moundville’s formal political consolidation around A.D. 1250 occurred against this backdrop of sociocultural differentiation and political tension. It was a deliberate attempt to spatialize and, therefore, fix key social and political distinctions in a massive monumental layout that privileged some groups at the expense of others. But even as they conclude that it was implemented in less than only five decades and with the coordinated labor of at least one thousand people, archaeologists place little emphasis on the role of outright coercion, recognizing that the remaking of traditional landscapes in a formative context comes about through the permission of communities-at-large. The Moundville people had decided upon an inclusive tradition – a collective identity – for which a new social memory was required; the mound-and-plaza arrangement was its negotiated materialization, the cornerstone not just of what was to come, but of what had come before. The purposeful destruction of Mound X, for example, reveals that even former monuments were subject to reevaluation. John Blitz interprets the act as an example of “repressive erasure,” a form of selective forgetting instigated by political agents to ensure discontinuity and obliteration. It is likely that Mound X was not the only symbol deemed contrary to the new social order. The plaza, in particular, probably played a crucial role in erasing and replacing what had come before. 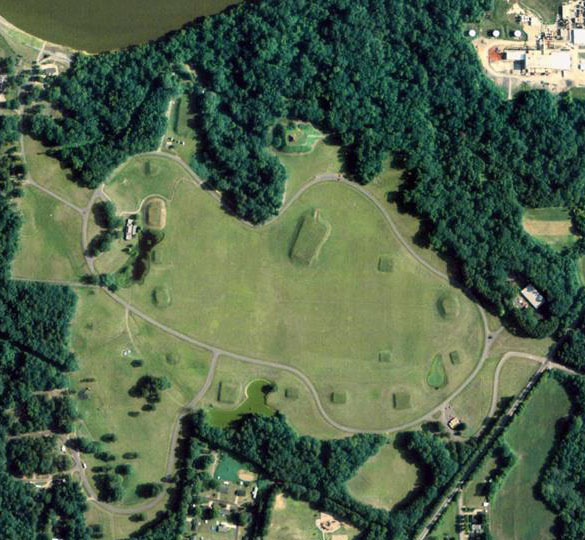 Once regarded as so much empty space, trenching, small-scale excavations, and auger and shovel test surveys now make it clear that Moundville’s plaza has a complex history of use. It was physically constructed at a time when the multiple-mound and palisade arrangement was first established. 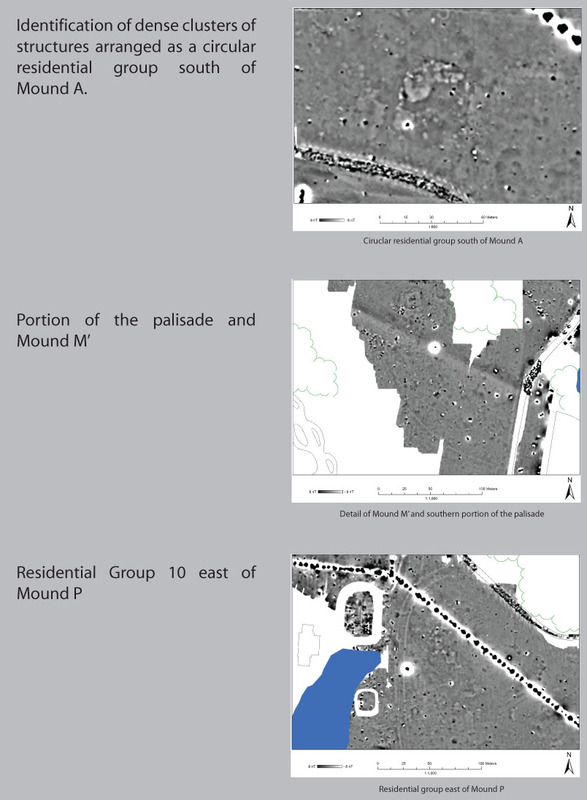 Measured conservatively at 23 hectares, it obscures far more of the early community plan than all 29 mounds combined. The primary goal of the Moundville Plaza Project is to determine exactly what types of constructions the plaza replaced. The Moundville site of west-central Alabama was the seat of a Mississippian chiefdom that originated in the thirteenth century and rapidly rose to regional prominence. At its political height it was a place with all of the monumental hallmarks of a Mississippian capital town, a built ceremonial landscape composed of 29 earthen mounds arranged in pairs around an expansive plaza, all of it enclosed within a mile-long wooden palisade studded with archers towers. The rectangular mound layout forms a “sociogram,” a massive social and cosmological symbol in which the size and position of each mound pair correlates with the size and status of the segmentary kin-group that used it. Mound summits were crammed with special structures: craft workshops, ritual buildings, and the residences of influential families. Some of these were large, over-engineered constructions employing meter-wide cypress logs as internal roof supports. Moundville was built to impress. 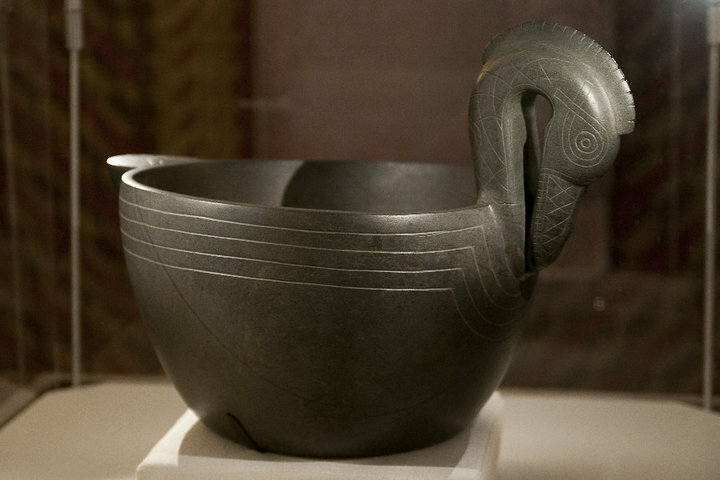 The “Duck Bowl,” painstakingly carved from a diorite boulder. 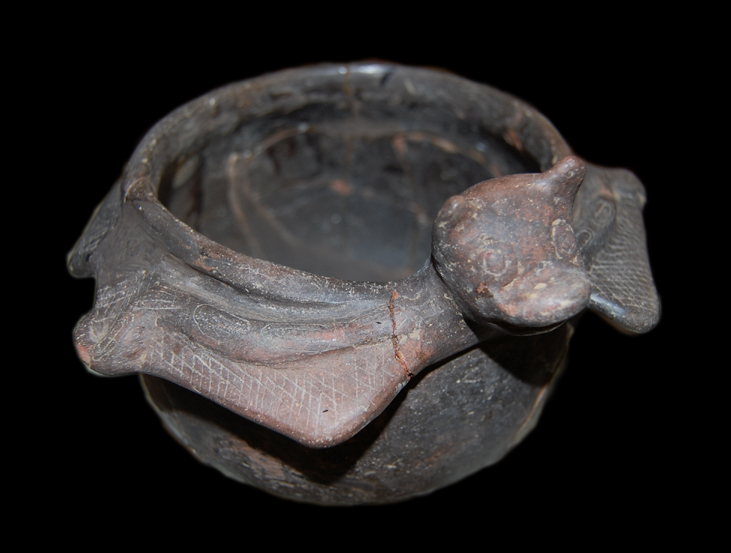 A ceramic bat effigy vessel. This charming object is also a rattle – the bat’s head is hollow with pellets loose inside. 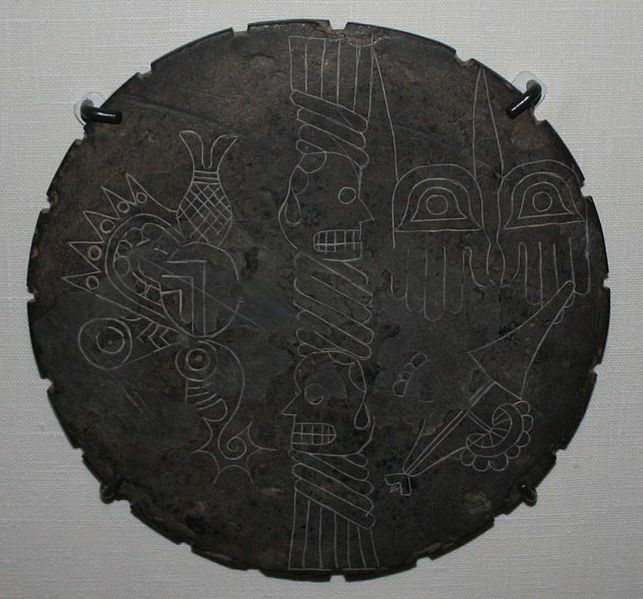 The “Willoughby Disk” is a stone palette upon which Moundville priests mixed medicinal resins and pigments. The iconography relates to tobacco smoking, ancestors, and the supernatural origins of the object. 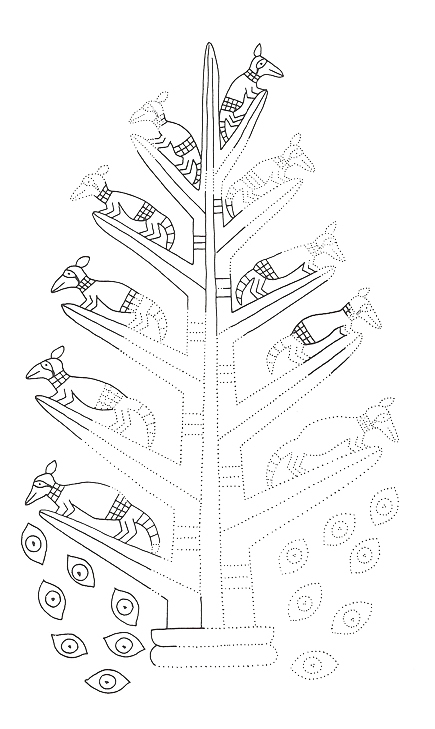 Moundville artisans were some of the most talented in the Mississippian world. They crafted in stone, shell, copper, and clay in addition to media that have not survived the intervening centuries of Southern humidity: wood, cane, and natural fiber. They created images of the creatures that populated their world. These included frogs, fish, bats, ducks, woodpeckers, owls, raptorial birds, panthers, and others animals with which we are all familiar, in addition to a pantheon of composite monsters and supernatural men and women. The chiefdom incorporated a population of at least 10,000 men, women, and children who were distributed among small farming settlements along a forty-kilometer stretch of the Black Warrior River and its tributaries. Each household made what it needed to survive (tools, food, cooking pots), but were connected to more distant populations through trade networks that funneled through the capital town. Titles and property, including agricultural fields but excluding weapons, were probably handed down through women. Men pursued social advancement through war. Healthy individuals who survived childhood could expect to live between 40 and 50 years. The rise and fall of Moundville parallels that of other large Mississippian polities: rapid coalescence within the span of two or three generations, a subsequent period of relative stability, and a final protracted decline. By the 15th century, the chiefdom was a shadow of its former self. The bulk of Moundville’s populace had lost faith in its leaders, the great compromise chartered with the mound and plaza arrangement over 150 years before dissolved amidst political factionalism. The less influential families who had resided in the southern part of the capital town, abandoned the mounds of their ancestors and dispersed into the hinterlands. Their followers came with them. They established new communities centered on new mounds, but periodically returned to the depopulated capital to conduct solemn burial rites at the exact locations of their former dwellings. 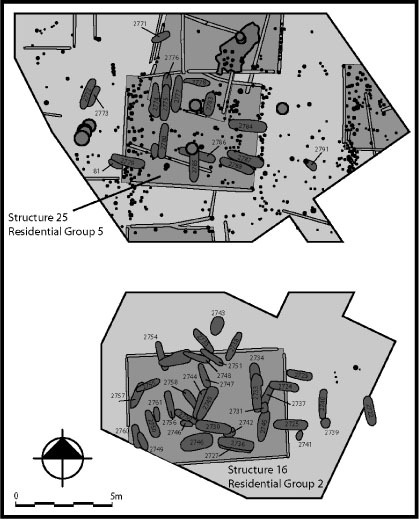 Plan or “bird’s eye” map of typical early period Moundville houses (rectangles) with intruding late period burials (dark ovals). From Between Plaza and Palisade: Household and Community Organization at Early Moundville by Gregory D. Wilson, page 97. Hernando de Soto passed through the area in the early 1540s. His chroniclers make no mention of what was surely the largest mound center along the route. Moundville had been falling into ruin for decades by then. The Black Warrior Valley, once the center of one of the largest and most socially and politically complex societies in prehistoric North America, was an uninhabited borderland between warring proto-Creeks and Choctaws by the end of sixteenth century. 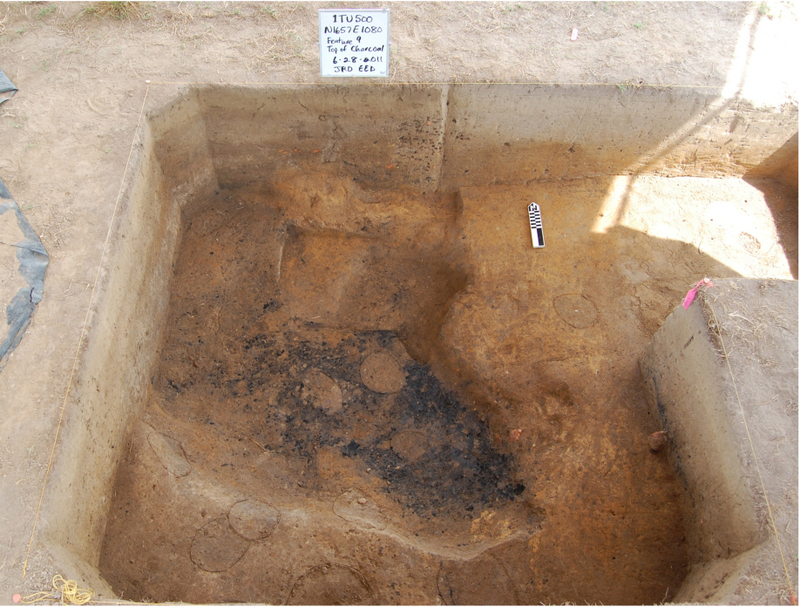 Welcome to the blog of the Moundville Plaza Project (MPP). I’m Jera Davis and the MPP is my dissertation project. Click here for a brief introduction to its rationale, goals, and methods. I created this blog as way of connecting with my friends, family, academic colleagues, and the public. Over the course of the 2012 summer field season, members of the crew and I will share our findings directly with you. This way, you won’t have to visit us in the field to find out what we’ve been doing and you won’t have to wait for our publications (though doing either will indeed be worthwhile). Consider this a public forum. We happily invite all constructive comments, questions, and critiques. We will all benefit from that. Please bookmark this page and check back regularly for updates. 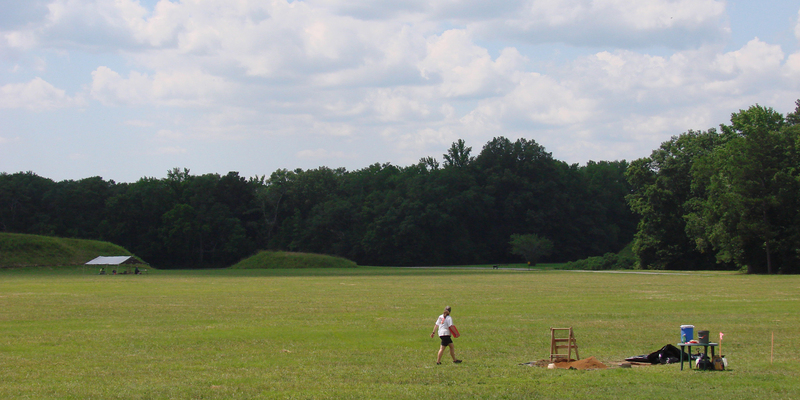 In the posts that follow, I will briefly review Moundville archaeology and the accomplishments of the MPP to date. We are happy to have you with us!